On Tuesday 14th August, Danihers attended an opening of the Good Samaritan Early Learning Centre Playground. We were thrilled to have been invited to this amazing community event. At the opening of the new playground we were impressed at the table spread which was all made by the parents in the school community. They had cooked delicious traditional Iraqi food and desserts. What a welcome! 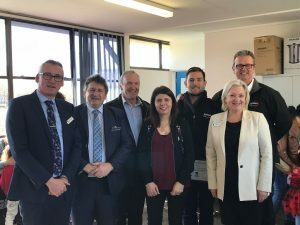 This event was hosted by the school’s Principal, Paul Sedunary, his Deputy Principal Helen Smith and Early Learning Centre Team Leader, Nancy Greige. Cr Geoff Porter, Mayor of Hume City Council was an honorary guest who has always supported Good Samaritan’s mission. Good Samaritan Primary School houses approximately 700 students and is set on a large acreage with an ever-growing local community. 80% of the school community consists of refugee children from Iraq, these brave children have encountered war at such young age and have come into a country that’s foreign and new. School’s Principal, Paul Sedunary had a vision to open an early learning centre which would assist parents in learning and development of their children from early age onwards. This will also assist these young children from Iraq in learning English and adopting into Australian community. 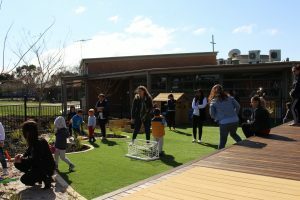 Early Learning Centre at Good Samaritan is one of few in Melbourne; it is aimed at children from zero to five years of age and their parents. The purpose of this program is to assist parents in finding best ways to play with their children which would then help in their development and readiness for school. 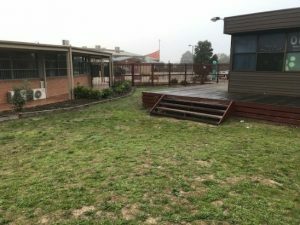 Good Samaritan Primary School leadership team came to Danihers for some assistance on their outdoor area for the Early Learning Centre. Danihers completed the entire project from initial civil and earthmoving to carpentry, masonry construction, hardscaping (paving, fencing, synthetic turf) planting, irrigation to mulching. Danihers provided a re-design of the entire space, full re-measure and proposal along with quantities schedule outlaying costs and materials required. The design was presented using Sketch up pro which delivers a 3D visual of how the area will look on completion. 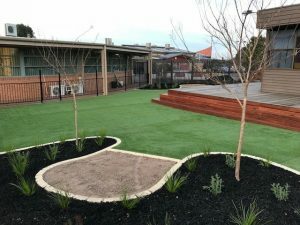 This visual displayed scaled tree sizes and plants, timber decking, timber screens, brick edging and sand pits as well as synthetic grass areas. 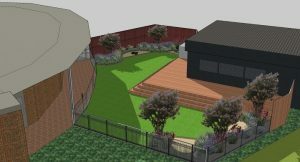 The construction began by removing the existing garden beds, timber sleepers, grass and the side panels of the current timber deck. We then installed a new timber merbau stairs to assist access from the building to the playing area. New timber feature screen was installed as well as a large synthetic grass playing area. To assist in providing shade during warmer months, we installed a new mature deciduous trees which will also feature colourful leaves that will give the space aesthetic appeal for most of the year. Below are images which define this exciting project right from beginning to completion for an amazing team of staff and students at Good Samaritan Early Learning Centre. Their support was fantastic throughout the whole process and we would like to thank the Principal Paul Sedunary and his team for this opportunity and their trust in the final delivery of this project. 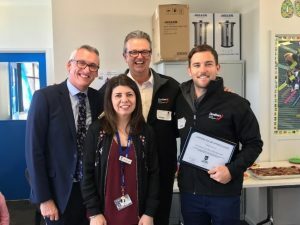 Anthony Daniher and Brad Vassal were presented with an award at the playground opening day by Good Samaritan Principal, Paul Sedunary for the project completed by Danihers. We are extremely proud and honoured to have assisted this learning center and their amazing community.